Get your customers to come over for your in-house milk coffee drink and make your place, talk of the town with latte neon signs. Wish to display your latte art with your caf� latte drink? What better way to do this than with latte coffee neon signs. Bystanders passing through will notice your eye-catching latte neon sign making them unstoppable to draw in to sip this specialty of yours. Visible from far, latte neon signs are sure to get noticed bringing in more number of customers and adding more to your pockets. We come up with a wide variety of stock latte neon signs that are displayed in different fonts and sizes. Latte flashing neon signs are best choice for those looking for motion and excitement for their establishments. Vertical or horizontal, our latte coffee neon signs are designed and available in the best possible way any one can think of. 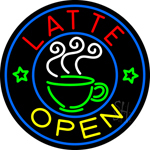 We also provide customized latte neon signs that would add grandeur to your locale. Apart from our customized collection, we also create hand crafted latte neon signs keeping your requirements in mind. Hand-pick a latte neon sign from our customized collection or provide us with your ideas, logos and other information and our designers will design and deliver you a uniquely creative version of personalized latte neon sign that matches your needs. Let your customers and others differentiate your caf� with the rest by the experience of your cafe latt� drink and customized latte neon sign. Contact us for latte neon sign today!